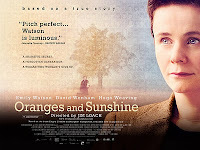 ORANGES AND SUNSHINE is a turgid earnest historical drama more suited to be a TV afternoon movie than a feature release. The debut feature of TV director Jim (son of Ken) Loach, the movie tells the true story of a British social worker in the 1980s who stumbled upon a scandal, whereupon British kids of unwed mothers were shipped off to workcamps in Australia in the 1950s and 1960s, only to be abused and exploited. This powerful material should've made for a powerful film but this film is damp, dull, earnest, attempting to beat the audience into submission. Emily Watson is becoming typecast in these suffering martyr roles - the only real revelation on the acting front is Hugo Weaving as a suffering man, so far from his superhero roles, and David Wenham as a macho Aussie bloke coming to terms with his childhood abuse. I suspect one would be better off reading the book upon which the movie was based. ORANGES AND SUNSHINE opened in summer 2011 in the UK, Ireland, Australia, Greece, New Zealand and Lebanon. It went on limited release in the US on October 28th. It is available to rent and own.